Award-winning author, Robert Thornhill, began writing at the age of 66 after a 36 year career in real estate. In eight years, he has published 29 novels in the Lady Justice series, the seven volume Rainbow Road series of chapter books for children, a cookbook and a mini-autobiography. Although Robert holds a master’s in psychology, he has never taken a course in writing and has never learned to type. All 39 of his published books were typed with one finger and a thumb. Lady Justice and the Geriatric Gumshoes is the latest in a long line of hits by popular author Robert Thornhill. In this episode, our hero Walt Williams inadvertently becomes the inspiration for an unlikely trio of fellow senior citizen crime-fighters, and finds himself spending as much time bailing out his uninvited allies as he does solving mysteries. Yet, in spite of their lack of experience, the bumbling amateur sleuths – with or without Walt’s willing help – do manage to make a small dent in the local crime scene and ‘retire’ a few of the local criminals. But with all the situations in which they find themselves, Walt fully expects to read their respective obituaries any day. From start to finish, these Geriatric Gumshoes are in over their heads, unaware of just how close to them death really is. As always, Robert Thornhill masterfully blends intriguing, straight-from-the-headlines mystery with a satisfying nod to the humorous side of life. Any reader who enjoys a good mystery tale or has an appreciation for good humor (or both) will certainly become a fan of the Lady Justice series of short novels. 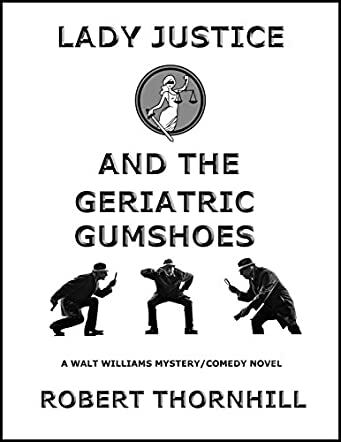 If you’ve not yet had the pleasure of immersing yourself in one of Walt Williams’ many contemporary adventures, Lady Justice and the Geriatric Gumshoes is as good a place to start as any. I urge you to pick up one of Robert Thornhill’s Lady Justice stories today and discover your new favorite author! Some of the tales refer back to previous stories, but it is not necessary to read them in order, as each one is a gratifying series of standalone escapades. So just pick one that strikes your fancy, and prepare to be entertained.